First, choose from Suy Sing’s extensive collection of grocery Christmas items which are available at everyday low prices. Next, select the packaging that best fits your needs. Choose from a variety of storage boxes, pails, and eco-friendly grocery bags of different colors & sizes. Lastly, pay for your orders through their easy payment options. What’s more, a minimum P50,000 worth of Christmas gift packs entitles you to free packing, free delivery, and exclusive rewards! 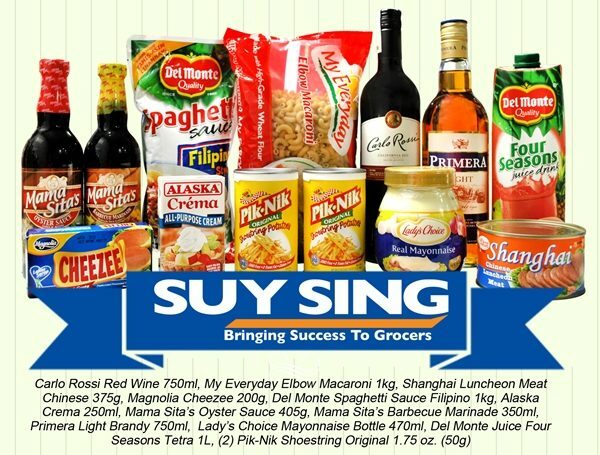 For the utmost convenience of holiday gift giving, Suy Sing also offers pre-designed Christmas gift packs worth P300, P500, P750 and P1,000 (Carlo Rossi Red Wine, My Everyday Elbow Macaroni, Shanghai Chinese Luncheon Meat, Magnolia Cheezee, Del Monte Spaghetti Sauce, Alaska Crema, Mama Sita’s Oyster Sauce, Mama Sita’s Barbecue Marinade, Primera Light Brandy, Lady’s Choice Mayonnaise, Del Monte Four Seasons Juice, Pik-Nik Shoestring Original). With Suy Sing’s customizable and ready-to-go Christmas gift packs, shopping for the perfect holiday gifts for corporate clients and friends becomes more convenient and affordable. For gift basket bulk orders, call 706-8822; 706-8835; 706-8840; 706-8846; 706-8857; 706-8871 or visit www.suysing.com.